Sewage – why is it a problem? Sewage is broadly a combination of domestic and industrial liquid effluent and suspended solids. It consists of organic faecal matter, bacteria, viruses, fats, chemicals, heavy metals, debris and nutrients such as nitrogen and phosphorous. Untreated sewage is primarily organic in nature and subject to bacterial decay. In low concentrations it can be beneficial to the marine ecosystem. However, discharged in massive quantities it causes ecological problems such as eutrophication (loss of oxygen from the water) and direct physical impacts to marine life such as poisoning, smothering, and the disruption of growth, respiration, reproduction, and the immune system. Raw sewage is full of pathogenic bacteria and viruses. Numerous studies have shown that swimming in sewage contaminated water can lead to gastroenteritis, acute febrile respiratory illness and ear, nose and throat infections. Hepatitis A and typhoid are also possible, although the scientific evidence for these associations is less robust. Shellfish grown in sewage contaminated waters can cause food poisoning because filter feeding animals such as mussels and oysters concentrate sewage relate pathogens and toxins in their tissues as they feed. The UK population uses around 17.5 million tonnes of water per day, and disposes of 11 million tonnes of wet sewage, every day. To do this the industry has over 380,000 km of sewers, 11,000 discharges from sewage treatment works and 27,000 intermittent discharges (storm outlets and combined sewer overflows). The water industry therefore has the single greatest impact on marine and coastal pollution and requires careful environmental regulation. The 11 water and sewerage companies and the 13 water supply companies run the water industry. The Environment Agency in England and Wales, and the Scottish Environment Protection Agency and the Department of Environment Northern Ireland are the environmental regulators. The industry is overseen in England and Wales by the Government’s Water Services Regulatory Authority (Ofwat), in Scotland by the Water Industry Commission, and in Northern Ireland by the Utility Regulator. The 1991 European Urban Waste Water Treatment Directive (91/271/EEC) has been the principle legislative driver for quality improvements to sewage treatment in the UK. Since privatisation in 1989, industry has invested £70bn in water and sewerage infrastructure in England and Wales – about twice the annual average capital investment of 1980s. About £10 billion of this investment has gone toward improvements to point source sewage discharge to the coast. In September 1998, the UK Government announced a seven year improvement plan to provide secondary sewage treatment as a minimum standard at all treatment works serving communities greater than 2,000 people in England and Wales. This target has now almost been met. Public water and sewerage services in Scotland are delivered by Scottish Water, a publicly owned company set up by the Scottish Executive in 2002. The Quality & Standards III capital investment programme will spend £2.15 billion between 2006 and 2010. In Northern Ireland, water and sewerage services are delivered by the Northern Ireland Water Service (NIWS) but province is in dire need of investment. In December 2005, a report issued by the UK Department of the Environment’s Northern Ireland Environment and Heritage Service concluded that NIWS was responsible for 23.5% of all water pollution incidents during the previous year. NIWS has now introduced a £420 million in wastewater treatment works and sewer network upgrades to improve this situation. Sewage – what’s the situation now? Almost all communities over 2000 population equivalent on the UK mainland, except notably Brighton, are now served by secondary sewage treatment plants, or better. According to data collected for MCS’ Good Beach Guide, there remain 62 outfalls continously discharging raw, primary or preliminary treated sewage. Almost half (27) of these are in Scotland. The Environment Agency currently estimates that between 4% and 10% of UK designated bathing beaches will fail the new minimum bathing water standard. Measures to achieve full compliance will largely require reducing the impact of diffuse pollution and intermittent storm sewage discharges. The UK Government estimates that the cost of achieving of compliance with new European bathing water standards will be £200 million per year for the next 25 years. The UK has a network of 22,000 combined sewer overflows (CSO) which discharge storm water mixed with raw sewage to rivers and the sea when it rains. They are intended as a failsafe mechanim for combined sewer systems (sewers which collect domestic sewage and storm water in same system) by discharging the contents of flooded sewers away from roads and houses. (and occasionally dry weather) and spill frequency can vary from very low to several hundred times per year. Discharge consents for CSOs, issued under the Water Resources Act (1990) and regulations introduced to transpose the European Urban Waste Water Treatment Directive, generally require that a CSO is maintained in a fit operating state and that discharges do not cause an environmental nuisance to users of the receiving waters. CSOs near sites regarded as ‘sensitive’ under the Urban Waste Water Treatment Directive ie: designated bathing sites and shellfish waters, are generally limited to a spill frequency of between three times per year and once every five years, depending where the CSO is sited. An extensive programme is underway throughout the United Kingdom to upgrade 2,200 unsatisfactory CSOs. Unfortunately, the UK CSO network has never been properly mapped, and finding unmapped CSOs is proving a significant problem in some areas. In the period 2005-10 water companies have concentrated on modifying 1500 CSOs to improve the aesthetic appearance (bottles, rags, cotton buds etc) of floodwater. Intermittent sewage discharge – what’s the situation now? The European Commission states that discharges of urban waste water from CSOs cause pollution, threatens the survival of fish and poses human health risks. Increased annual rainfall and severe storm events, driven by climate change, will increase the environmental impact of CSOs unless measures are introduced to limit spill frequency and increase CSO storm water storage capacity. Bathing water quality has declined from a high in 2006. CSOs and storm run-off from city streets and farmland are largely to blame. Almost 50% of all tested bathing sites in the UK still offer an unacceptable health risk to swimmers. Diffuse pollution is a catch-all term to describe non-point source pollution to rivers and the sea. Diffuse pollution is sub-categorised into a) agricultural b) urban, c) atmospheric. Types of diffuse pollution range from nutrients (largely nitrate and phosphate based fertilisers) and livestock waste washed off farmland to oil, petro chemicals and endocrine disrupting chemicals flushed from urban areas into storm drains, water courses and the sea. Atmospheric input is principally air borne nitrogen oxides from burnt fossil fuels which can contribute significantly to the nitrate content of the oceans. The UK Government estimates that almost two million tonnes of nutrients are discharged into UK coastal waters each year and as discharges from point sources (pipes) have improved in quality so diffuse pollution has become relatively more problematic. River basin characterisation studies for England and Wales conducted by the Environment Agency under implementation work for the Water Framework Directive (WFD) suggest that 25% of estuaries and 24% of coastal waters are at risk of failing the new environmental standard of Good Ecological Status because of diffuse pollution. Diffuse pollution – what’s the situation now? 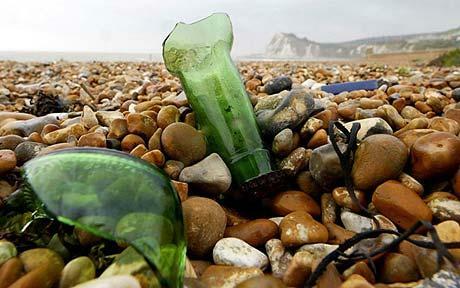 The Environment Agency for England and Wales (2007) states that over a third of estuaries and a fifth of coastal waters are at risk from diffuse pollution. The agency says that this represents a widespread and long-term threat to the ecology of these waters. The UN Global Environment Report (2007) states that pollution from diffuse land sources, particularly agriculture and urban run-off, needs urgent action by the world’s governments. Nitrate and phosphate discharges from point sources to rivers and the sea have reduced by 35% since 1990, but nitrate input from rivers to the sea has not fallen. 10 estuaries in England, two in Wales and one in Scotland are now recognised as eutrophic, or likely to become so, because of diffuse pollution. Eutrophic effects include toxic algal blooms, green macro algae such as Enteromorpha smothering intertidal habitats, ecological changes in littoral and sub-littoral habitats and oxygen starvation for sedentary benthic organisms. Nitrate and phosphate concentrations around the UK coast have not changed since 1985. Nutrient concentrations are high compared to international criteria in some estuaries and coastal waters off southern England and the eastern Irish sea. There has also been a 90% increase in phytoplankton biomass since the mid 1980’s. Offshore waters are believed not to be affected. I found this article at The Surfers Path, and whilst it’s not directly Europe or UK news, as the author points out, this problem is worldwide. • Cigarette butts are the most littered item in the world. • Over two billion cigarette butts get tossed everyday. That’s an average of two cigarette butts daily from each of earth’s 1.2 billion smokers. • At beach cleanups, cigarette butts are the most common form of trash found (typically accounting for one in every five items collected). • The cigarette filter was designed to trap the toxic chemicals in the cigarette smoke from entering the smoker’s body. When submerged in water, the toxic chemicals trapped in the filter leak out into aquatic ecosystems, threatening the quality of the water and many forms of aquatic life. • Cigarette butts may seem small, but with an estimated 4.5 trillion butts (worldwide) littered every year, the toxic chemicals add up! • Over 99% of cigarettes are now smoked outside. • 18% of all litter dropped to the ground is washed into streams, rivers, lakes and the ocean by storm water runoff. Cigarette butts, are little and lightweight and are the first to get carried away into our waterways. • Studies indicate that since we have enacted indoor smoking bans, more cigarette butts are being tossed directly into the environment. Unfortunately, this means that ecosystems have a higher chance of being affected by cigarette butts. Biologists have found butts in the stomachs of young birds, sea turtles and other marine creatures. Acetone: It’s one of the active ingredients in nail polish remover.